A full length portrait by Antoine Pesne, engraved by Richard Houston, served as the source for the portrait printed on the mug. An additional view of the mug and its designs. 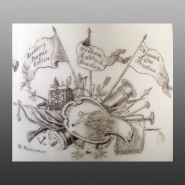 Also printed on the mug are the flags of "Military Trophies" with the inscriptions: "Reisbert./Prague./Collin," "Welham./Rossback./Breslaw.," "Neumark./Lissa.Breslaw." A bell-shaped mug of soft-paste porcelain with overglaze bat-printed design in black. 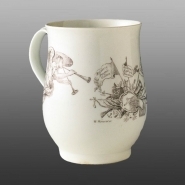 The mug has three printed designs; the primary image, known as King of Prussia No. 2 is a half-length portrait of Frederick, King of Prussia in armor. The design, titled “KING of PRUSSIA” and dated “1757”, derives from a full length portrait by Antoine Pesne, engraved by Richard Houston (see below). Also see the additional designs printed on the mug below.